"LATE" SEEMS TO BE MY THEME FOR THE MONTH OF NOVEMBER. BUT AS THEY SAY, BETTER LATE THAN NEVER. Nebraska. The Cornhusker State. Home to mile-long freight trains, farmhouses with white picket fences, Father Flanagan’s Boys Town, Kool-Aid (which was ­developed in Hastings in 1927 when the soft drink syrup “Fruit Smack” was changed into a powder, making it easier to ship), Johnny Carson, cornfields (er, make that LOTS of cornfields), and the “Junk Jaunt .” This would be the romantic event my sweetheart and I went to, to celebrate our anniversary. Now, stop shaking your head. After all, we did think of a few other vacation options. A cottage on the Oregon coast would’ve been nice. One problem though. Not being ones to plan far in advance, have you ever tried to book a cottage on the coast three weeks before you go? And besides, what would we do? I can’t sit still for more than about ten minutes. One of my husband’s most charming qualities is his desire to make me happy. So when I suggested that we go to Nebraska for our anniversary – our 25th no less – and go junking, he agreed, albeit just a tad reluctantly. So we rented a toy hauler trailer and a-camping we went, in search of good junk in the middle of the Heartland at over 600 yard sales during Nebraska’s 10th annual Junk Jaunt. The Junk Jaunt is a three-day, 300-mile event in a teardrop-shaped loop with Grand Island at the bottom and the 35 participating towns in a circle above it. Each town was from five to 30 miles apart with populations ranging from 70 to 3500. Places with names like Dannebrog. . . Ord. . . Broken Bow. . . and Cairo (pronounced Care-oh). That’s where we started. We went to check out Cairo the night before it all began, only to find out it had begun. Mike Stutzman, Cairo vendor #2, was brightly lit and open for business that warm September evening and he was selling junk fast. Hmm, what to choose? Vintage bikes, more than 20 of them. Little red wagons, several. Farm junk, LOTS. Bike baskets, all bent which-ways. License plates, wood doors, knives, stools, pedal cars, enamel signs, milk cans, more farm junk. I’m telling you right now, this is junking heaven. . . .
•Billy & Beth Adams (Merna vendor #11). E. Ewing Ave. Fri-Sat 8A-6P; Sun8A-4P. Antique doors, screen doors, barn doors, barn siding, architectural salvage, tools, car parts, claw foot tub, repurposed salvage, shelves, wooden boxes, old beds, table, old cabinets. • Junk and Stuff (Burwell vendor #12). S. Hwy. 11/Rodeo Grounds Fri, Sat & Sun 8A-??? Glassware, dolls, toys, wheels, farm primitives, tools, kitchen utensils, hoe-wheels, disks, blades, seed sacks. 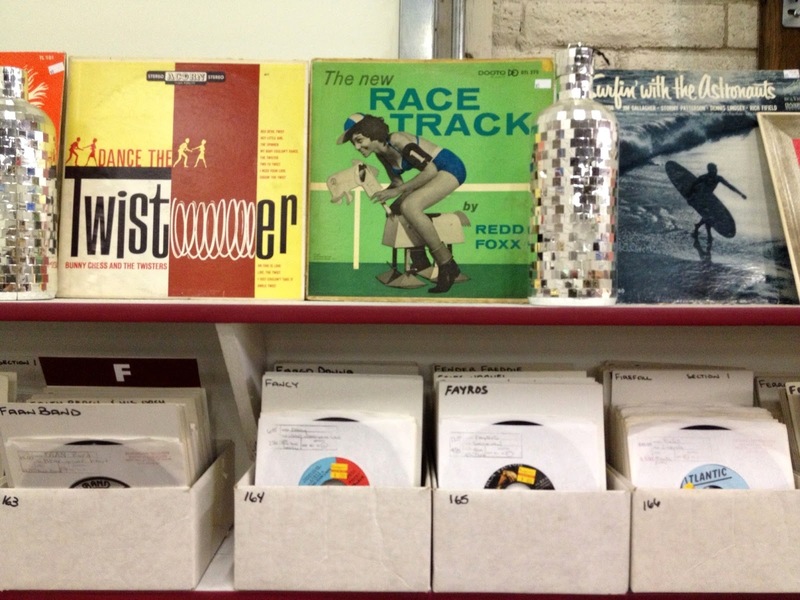 We stopped by Junk and Stuff – a.k.a. Edgar and Ellen – first thing Saturday morning. They were busy pouring icy water out of every item that could hold water since it had rained two inches the night before. Their hands were freezing, but they were not ones to complain. Instead they smiled and chatted and gave us good deals on farm junk and some restaurant ware dishes. And on a pair of Edgar’s lined leather mittens since my hands were freezing too. And they invited us to come back and see them again – and they truly meant it. . . .
Rotary hoe wheels, baby buggy wheels, and a bike wheel. A hat box, a green metal box, two refrigerator boxes, a divided wood box, a cottage cheese box, a couple of rusty boxes, and a box of watch parts. A small wood table, a wood spindle frame, a bunch of chippy wood chairs, a folding wood yard stick, and a wood duck (er, a wooden duck). A red metal tool box, a red strainer, a red sand shovel, a red “Icy- Hot” Thermos, and two red kitchen stools. Some blue canning bottles with zinc lids, a couple of wind-up clocks, a bike basket, a fence gate, some antlers, corset lacing, a leisure suit, a rusty Radio Flyer and some windmill blades. And there’s more. Lots more totally delicious junk. . .
Did we make it to all the sales we wanted to go to? Goodness, no. Did we have fun? Oh my, yes. Would we do it again, you ask? Why yes, I think we would. 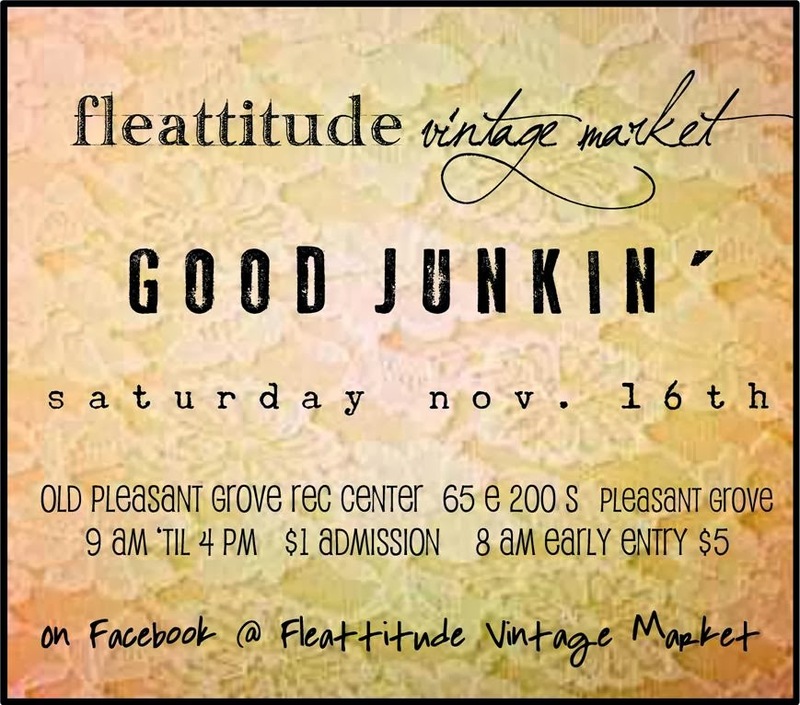 Actually, we’ve already made our reservations for next year. . . .
AND DON'T FORGET THAT THIS SATURDAY MORNING IS THE "FLEATTITUDE" SALE IN PLEASANT GROVE. 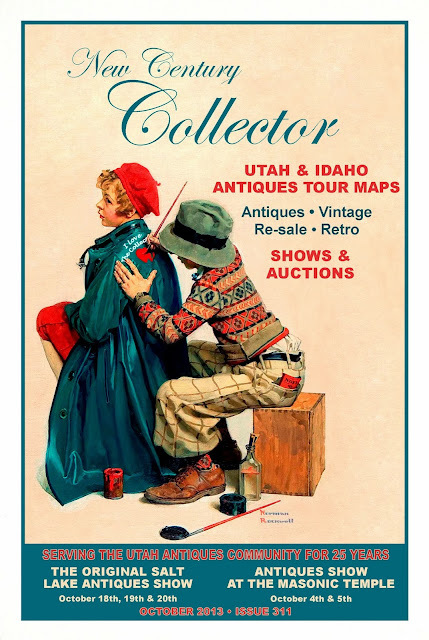 PICTURE THE ENTIRE UTAH COLLECTING SCENE AT YOUR FINGERTIPS! Spend a little - find out a lot! 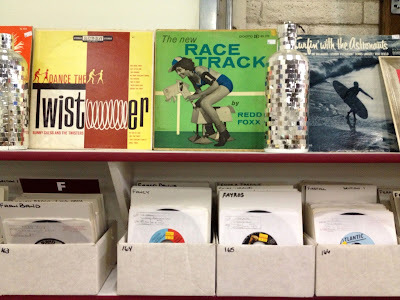 VINTAGE VINYL......... PULL UP A CHAIR & SIT A WHILE! 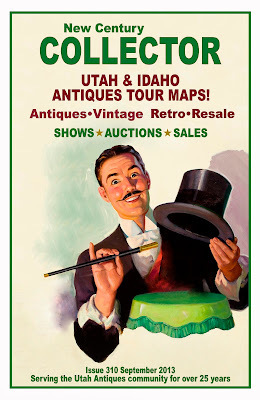 Occasionally, Lyn & I like to spend a few hours on Saturday mornings lurking around Salt Lake estates sales. And, as Lyn wanders the house, bedazzled by all the goodies, and wondering if today is the day the universe will reveal the identity of her next collection, I usually search out the seller to make my stock inquiry; "Any old records kickin' around here?" I stand there holding my breath, hoping that the gods will be with me, and that the heavens will open to reveal an old cardboard box or two containing the dusty old black platters that are the source of my amusement. If I'm lucky, I'll find myself squatting on the floor, sorting through a couple of dozen old albums, continuing a 30 year quest to reclaim the soundtrack from my teen years one or two records at a time. Imagine my amazement when I walked into the Salt Lake Vintage Flea Market, and found my friend Will Dator sitting in the middle of tens of thousands of records. 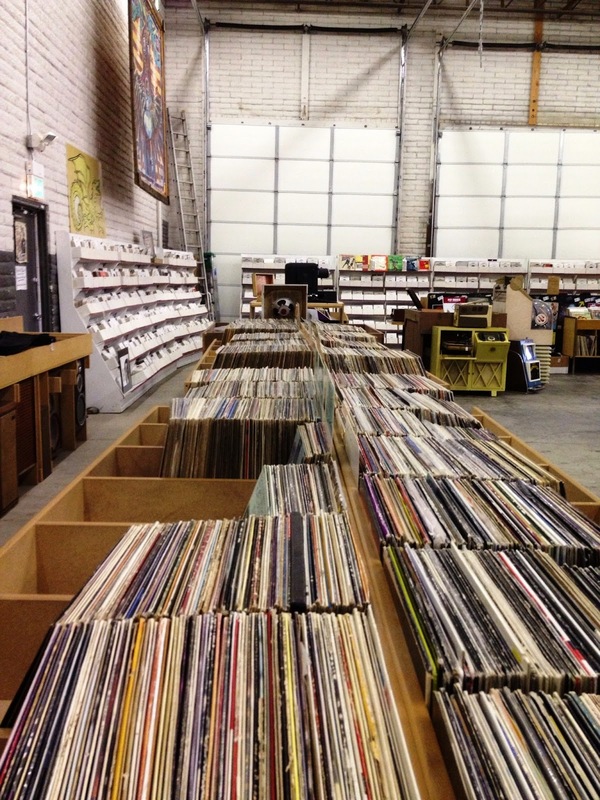 The record mother lode. I was truly breathless. I knew two things: "I'd need a chair, and I'd need some food", I was going to be there a while. As I looked around, I noticed that the area was not only filled with old record albums, but thousands of 45's, as well as an old juke, some vintage sound equipment and rock & roll paraphernalia. I was salivating. My only disappointment was pallet after pallet of unboxed and unsorted potential treasures still stacked up in the back. I began searching through hundreds of albums, and even payed a little attention the the 45's (which I think of as sort of like a backup girlfriend; a nice diversion in a pinch, but your not taking her home to mom for Sunday dinner). 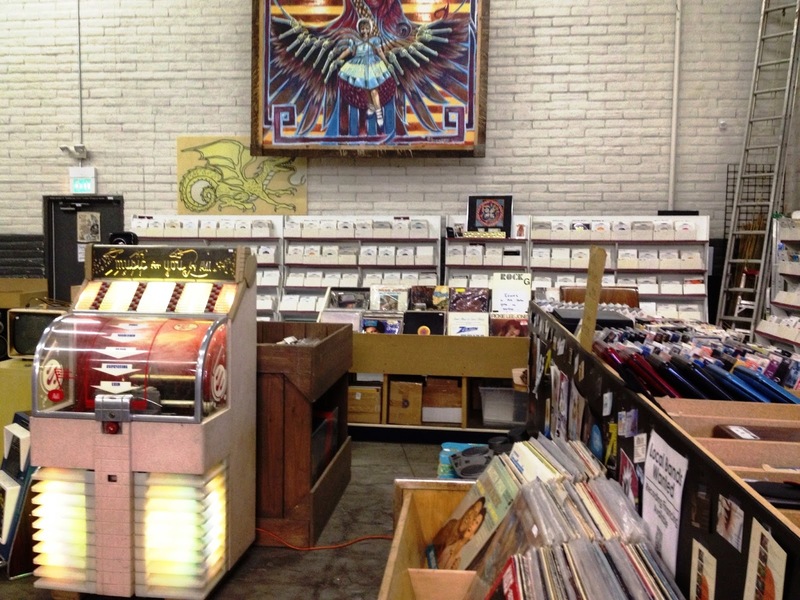 Still, I just couldn't take my eyes off all of those pallets of records in the back. I was haunted by the idea that someone might get to them first. But, I salved my disappointment with the knowledge that there were plenty of records for everybody, and I was going to be back often. 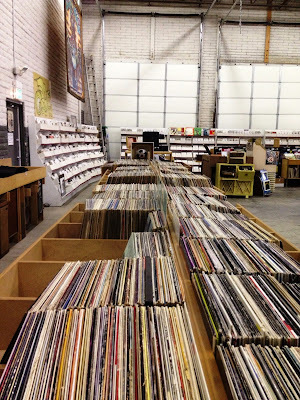 If the hunt for old records keeps you awake at night, get yourself down to the Salt Lake Vintage Flea Market and check out VINTAGE VINYL. Stop and say hello, I'll be the guy in corner with the glazed eyes and five o'clock shadow. 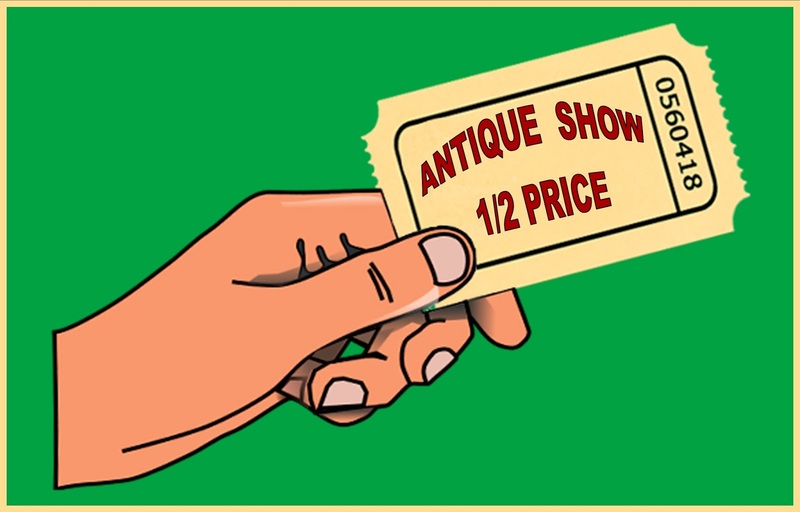 If you're a collector, chances are, you love antiques flea markets. 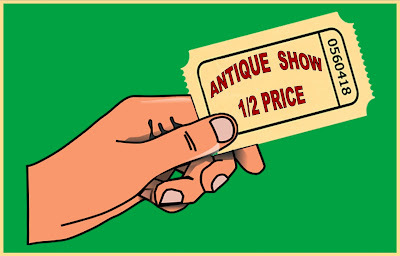 Sunday mornings filled with sunshine, fresh air and antiques & collectibles at bargain prices. 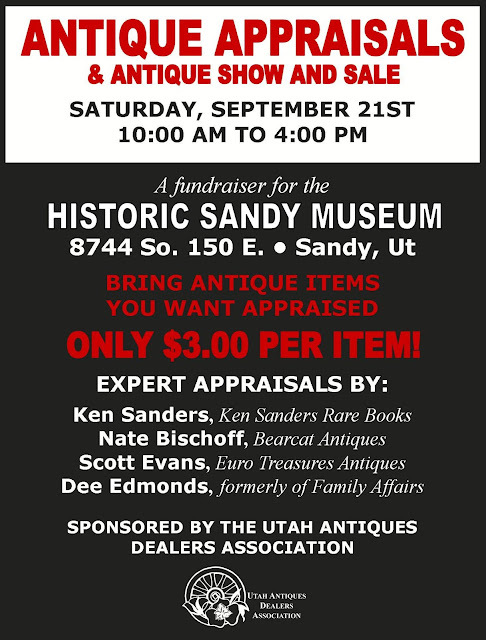 Unfortunately, the Salt Lake area has had little to offer vintage & antiques collectors for a long long time. The once dominant Redwood Drive-in swap meet long ago digressed into little more than an ethic market, offering new & used low cost merchandise, and the on again off again Salt Lake fair park flea market was never more than a pretender, offering mostly a cacophony of dismal yard sale merchandise. Well, things are are definately looking up for those of us in search a little sunday morning diversion. 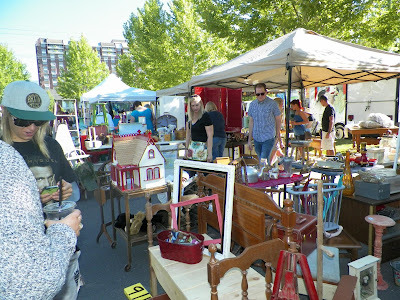 It seems Walt Disney had it wrong, on every second Sunday throughout summer & fall, the happiest place on earth is actually the Salt Lake Urban Flea Market. If you're sick of wandering through a wasteland of chipped dishes, broken toys and kids clothing, the Urban Flea Market, sprawling under the trees on the south side of 600 South Main Street, offers a dose of just the right kind of medicine. 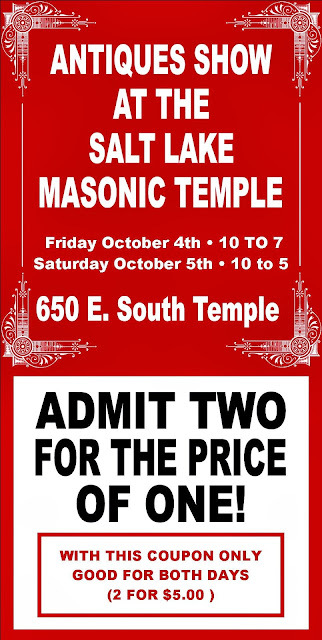 In it's third year, promoted by Michael Sanders of Now & Again, and Kate Wheadon from KRCL 90.9 Radio, the Urban market is "the" open air bazaar Salt Lakers have been waiting for. You couldn't ask more from a Sunday morning antiquing excursion; a cadre of antiques, vintage, craft and art dealers mixed with food sellers, a little music and a farmers market. You can feed your soul with everything from an old lamp to Navjo tacos. And, best of all for us misers, not only is the sunshine and fresh air free, we can walk in without leaving that obligatory buck at door. So for me, there's just no choice. I'll be skipping sunday school and taking communion under the tents at the Urban Flea Market. If that's just not an option, don't worry, The market is open until 3:00 in the afternoon for late sleepers and church goer's. While driving over to Liberty Park Emporium the other day, to meet with shop owner Monica Zoltanski and take a couple pictures for this profile, ideas for the articles title seemed to be ricocheting around my head like pinballs against a set of new bumpers. However, by the time I pulled into the stores parking lot, I had pretty much settled on the moniker “CHICK MAGNET” around which to build the profile. 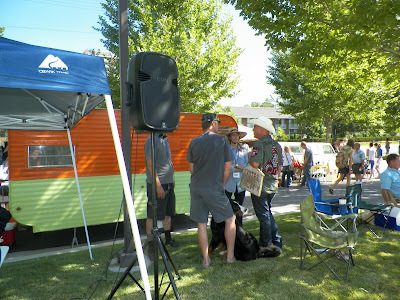 Last November, when Lyn and I dropped by Liberty Park Emporium for their grand opening celebration, I had barely eased past the front door before I began to sense the estrogen. The shop, described by Monica as a mix of selected antiques, home décor, trendy accessories and unusual gifts, was all of that. LPE was a terrific little shop, visually enticing, with lavish displays and stylish hand picked merchandise. However, I couldn’t help but feel like the cases, shelves and racks all seemed to be sending out a furtive whisper, “come on in girls”. Almost a year later, all I can say is “hey guys, pull up a comfortable chair and relax”. It seems that shop owner Monica Zoltanski has been busy weaving a little magic. I wouldn’t call the place a man-cave, there’s still plenty for the ladies to salivate over, but you’re also going to find enough old wood, brass and patina to bring on a smile. I found a few old cameras, crates, vintage sporting goods, industrial objects, old bottles, watches and antique furniture among what has become a diverse inventory. 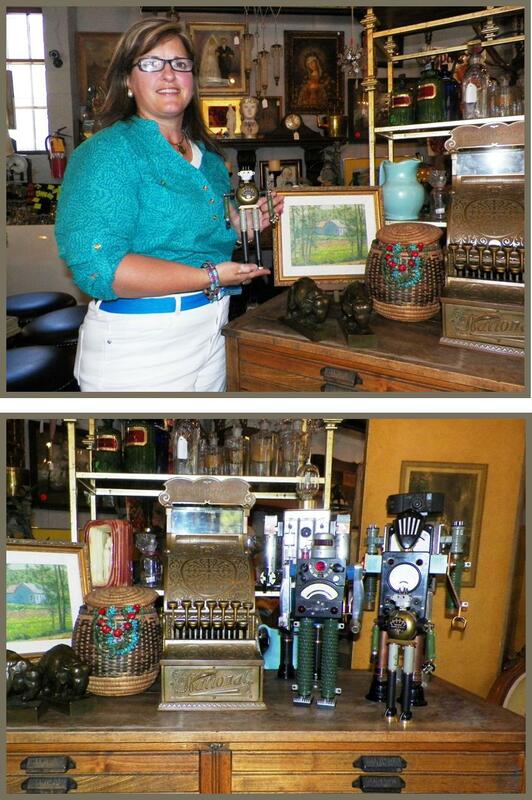 Along with antiques & collectibles, the shop also offers a nice selection of local art. Of particular interest were a small LeConte Stewart painting, a pair of Mahonri Young brass “Elephant” bookends, and a collection of particularly clever robots created from old gages and industrial odds and ends by Salt Lake artist Billy Wells. Evolution, seems like an apt description. Liberty Park Emporium has evolved into a very nice, well rounded upscale shop. If “survival of the fittest” is any gauge of endurance, It looks like we’ll be shopping at LPE for a good long time. Stop by and see this great shop again, for the very first time. LIBERTY PARK EMPORIUM is located at 1465 So. 700 E., in SLC. Open Tues. through Sat. 11:00 to 6:00. Happy hunting! In addition to selling vintage wares at flea markets and the antique mall, I sometimes have people come to my house to “pick.” They often ask me where I find all the treasures I have collected. Here are a few ideas on how to find the good stuff. Read between the lines... Online classified ads for yard and estate sales are one of my best sources for finding vintage items. However, yard sales follow the law of diminishing returns, so I make sure that I only go to the sales with the best potential during the short window of opportunity each week. First, type “antiques” or “vintage” into the search box in the garage sale section on KSL.com or craigslist and then “sift.” Look for phrases such as “40 years of accumulation,” “Grandma died and we’re cleaning out her house,” or “shed is full.” I avoid ads that say they have antiques and lots of new items, ads that only list one or two antiques, ads that list high prices and ANY ad that includes a Healthrider. It’s a lovely day in the neighborhood. . . As the saying goes, “Location, location, location.” Get to know which parts of town (or the state) work best for what you are hunting for. 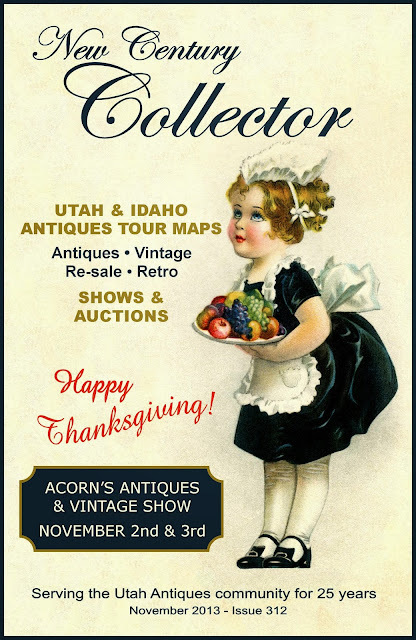 Many vintage aficionados prefer the Avenues and Sugarhouse for their picking. Others have discovered their own “secret” neighborhoods that yield treasures galore. Give different parts of town a try until you discover which ones are your favorites. And don’t rule out rural areas or distant parts of the state. Find areas that work for you. . . and go back often. Talk to sellers... What you see is often not all you can get. Recently I went to a yard sale that advertised that the house was being demolished. When I got there all that was outside was newer merchandise. 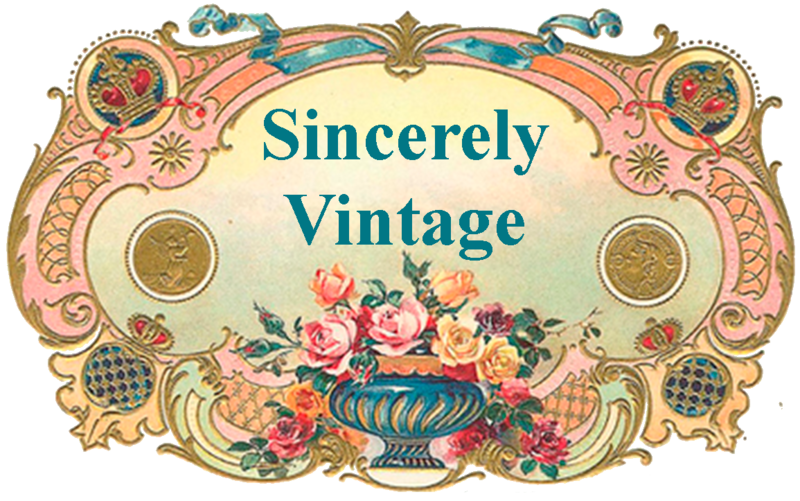 After asking a few probing yet polite questions, the homeowner invited me to go inside – where the vintage items were hiding. I came out with several choice items including six ornate wood chairs. 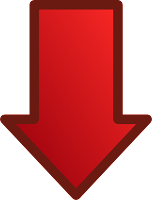 Another tip – flea market sellers and antique dealers frequently have additional merchandise in boxes, under the table, in their trailers, or back at home. Asking them what else they have will often yield fantastic results. Be a detective... The best vintage isn’t always on top. Or in the living room. You’ve got to be a bit of a detective, opening drawers, cupboards and boxes. Look under the table, at the bottom of the pile and behind the bookcase. Look in the basement. Once I went down into a cellar (that was basically a hole in the floor under a trap door) looking for treasure. That wasn’t the word I used for the dead cat I found down there that the owners weren’t aware of. . . . Another time I found an incredible tweed suitcase at a sale – with three vintage dresses inside. Road trip! A vacation is always a nice idea, don’t you think? Why not take a junking vacation your next go-round. 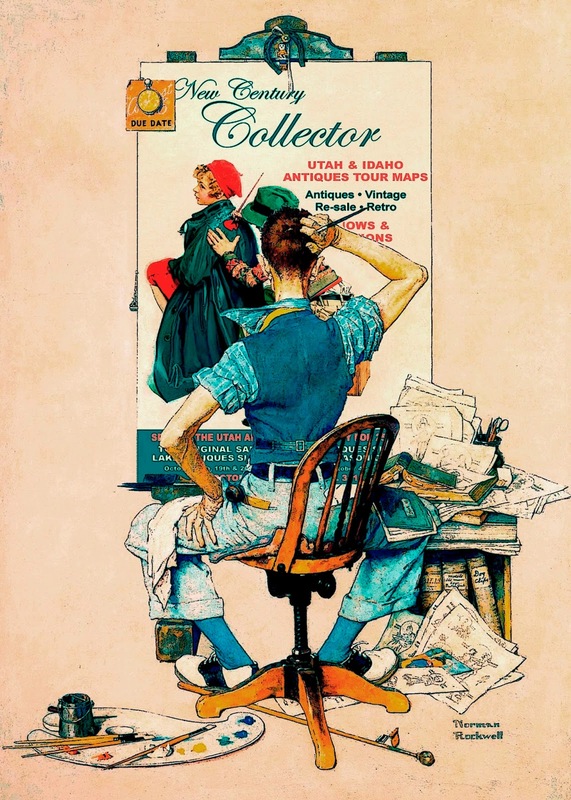 Flea market magazines love to publish lists of vintage sales and there is a new nationwide online vintage guide called FleaQuest that will give you the skinny on vintage sales, shops and flea markets from Atlantic to Pacific. In addition, there are several “hundred miles-long” yard sales – most in the East and Midwest – to give even the most seasoned junker something to drool about. So rent yourself a U-Haul (http://www.uhaul.com/), decide where to go (www.fleaquest.com), pick up a Trip Tik travel map from AAA (google “Trip Tik”; then type in your starting point and your destination) – and don’t forget to haggle! Before you go. . . Remember an over sized tote or two, a flashlight to illuminate those dark spots, a thick wad of cash, and a friend to help you carry your stuff home. 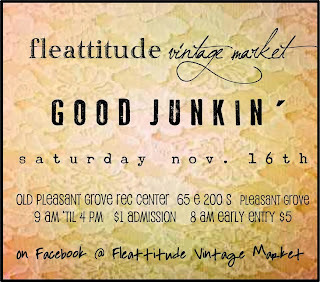 Happy junking! PUT A LITTLE MAGIC INTO YOUR LIFE.............. COLLECT! JUST GIVE THE COVER A LITTLE CLICK, AND TAKE AN EARLY PEEK AT THE SEPTEMBER ISSUE!